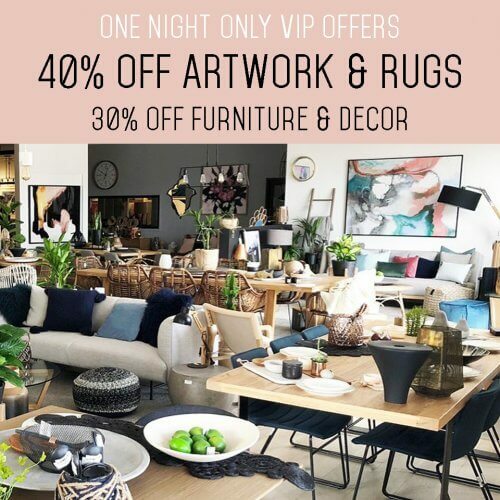 Home › VIP SHOPPING NIGHT at United Interiors! Melbourne folks; you’re invited to join us for a VIP shopping night! 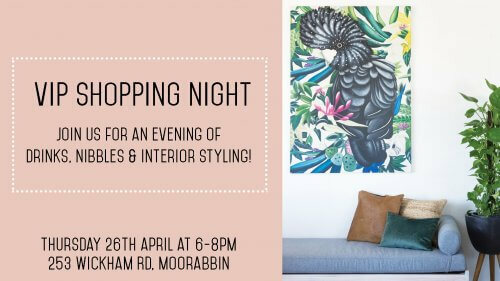 We are very excited to announce our first VIP shopping night of the year hosted at our Melbourne showroom & art gallery! Shop & Style with our in-house interior stylists as we walk you through this season’s trends in interior styling and answer all your burning questions about your home renovations, room re-decorations and anything in between! 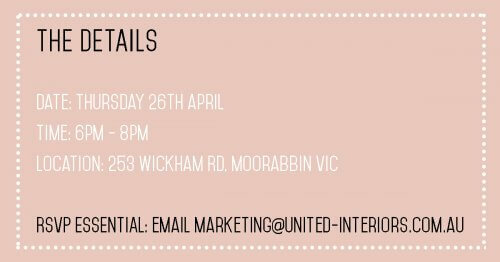 Join us for drinks & nibbles (and all things interior styling) from 6pm to 8pm on Thursday 26th April at our Melbourne showroom at: 253 Wickham Rd, Moorabbin VIC. Of course, it wouldn’t be a VIP shopping night without exclusive one night only VIP offers storewide! Shop all artworks and rugs for 40% off, and furniture and decor for 30% off! There is LIMITED CAPACITY available so our team can spend as much time answering questions about all things interiors. Reserve your place by RSVP via email now. Simply email [email protected] with your name and maximum of 2 guests that you may be attending with to secure your VIP place. First in, first served! Get in quick. We hope to see you there!